Preview Snippet #leadershiptruth - Balance is for tires. 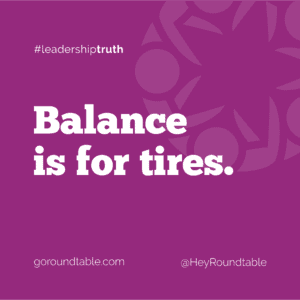 #leadershiptruth – Balance is for tires. Here are three words you just need to bury from your vocabulary: work-life balance. It’s a myth. It doesn’t exist. Car tires are balanced, work-life rarely is. Work the way it used to be no longer exists. It got torpedoed in the mid-1970’s and yet we all seem to cling to a notion that work happens between 9 to 5 and life happens outside of those hours. Well, we all know that work isn’t happening between 9 and 5. The new buzzwords are ‘work-life integration’ as if you have to have both things woven together seamlessly. I don’t buy it. I think about work-life rhythm. Sometimes the beat of the work drum is fast and furious. Other times, the beat of the life drum picks up speed. The key is to think about the beat you’re making right now and be conscious of what beats you’re ignoring and need to bring to the forefront. Life is messy. Work is messy. Rhythms get messy too but as the drummer, you’re always in control of the beat.